As a little child, I found the green angel wings indicator on my parent's Philips radiogram fascinating. I sat and watched and wondered how it worked each time we played a record. Why the blazes does it take three obscure keys (Cmd, Shift, 4) to do a screen grab on a Mac? Whoever thought that up needs to get three lashes with a wet noodle. 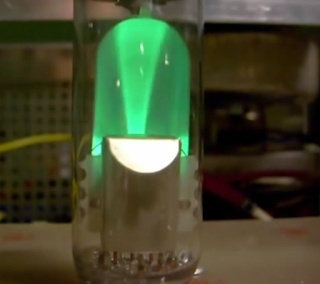 Basically, it is a miniature cathode ray tube with a curved zinc sulphide fluorescent screen. The electron beam is deflected by an electrostatic target in front of the screen, powered by a built-in triode amplifier, so everything you need (minus the PSU) comes in one convenient glass package. Some indicators are viewed end on making a cat's eye circle, others from the side, like this one. 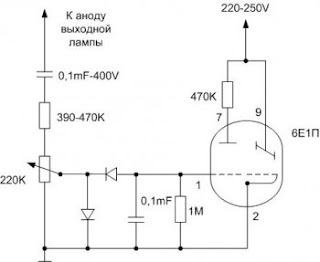 If you already have a thermionic valve amplifier, then hooking a volume indicator up is easy. As always with any electronic device, the biggest problem is finding the pin-out. It has the usual triode valve elements: Heater, Cathode, Anode and Gate, but with an additional Screen, behind a Target (deflector). So you can use the triode part as an amplifier to power the target, which controls the size of the shadow and width of the wings, thus making quivering angel wings on the screen. Viewed from the bottom pin side, the pins are numbered clock wise, starting at the gap on the right. These devices used to be manufactured in Martin in Slovakia and in Moskow in Russia and were licensed copies of the Philips tubes from the Netherlands. Contrary to Old Skool American propaganda about the 'iron curtain', there was a lot of co-operation and trade between Western Europe, Central Europe and the Soviets - same as today. My father in law was a Slovakian truck driver and crossed the fortified border to Austria regularly. There really wasn't much difference between the villages on either side of the border and everyone watched the same TV channels, but blue jeans were in short supply. Any Slovakian teenager with a pair of jeans was 'waaay cool' and my wife can still remember how she showed off when she got her first pair. Unfortunately, I could not see any clear indication of exactly where my angel tubes came from, but the Russian lettering shows it was one of these two factories, since Philips would not print their tubes in Cyrillic. The thing to bear in mid with tubes, is that the gate operates at a voltage negative with respect to the cathode. The envelope detector diodes are oriented such as they are, to create a negative control voltage. If you put them the other way around, then the circuit won't work. You can also put a trimmer and bypass capacitor on the cathode, so you can adjust the DC bias and get the wings to close. To make you little angel dance, simply put an AM envelope detector on the Gate, heat the Cathode, Bias the Anode, keep your fingers away from the high voltage parts and Bob's your uncle! BTW, it may be a good idea to put a rubber mat on the floor in your workshop.